This is a short list of our most frequently asked questions. For more information about ReallyColor, or if you need support, please email us at info@reallycolor.com. 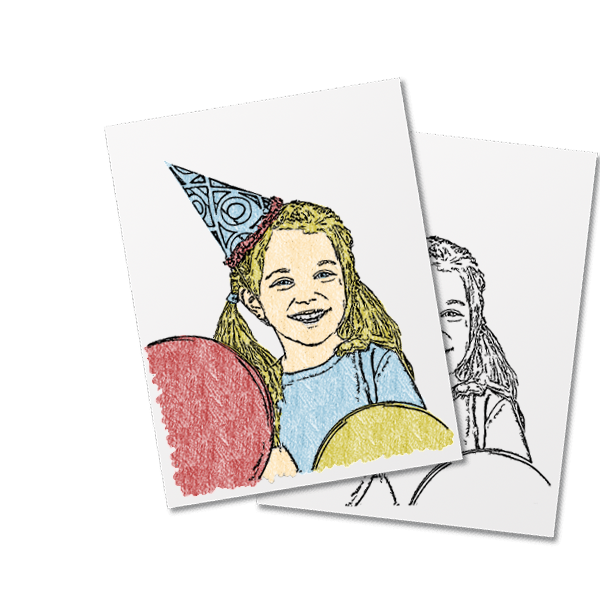 At ReallyColor, we have built patented technology that allows you to turn photographs into coloring pages. What size are the coloring pages? You will receive a high quality PDF file that is a full 8.5” X 11” page. Our coloring books will also have full size 8.5” X 11” pages. ReallyColor photo credits can be purchased on ReallyColor.com. All pricing is available on the site. Do my Photo Credits ever expire? Once your photo credits are in your ReallyColor account, they do not have an expiration date, so come back anytime to make more coloring pages! What is a photo credit? You can make as many coloring pages as you want for free and see the preview, but you need one photo credit to keep the high-quality PDF coloring page you’ve made. We don’t store user content, and even though we do email you your coloring pages for safe keeping, we strongly recommend that after using a credit to complete a coloring page, you open the PDF file right there and save it just in case of the rare email issue that is out of our control. If you can’t find it in your email, don’t forget to check your spam or junk folder. Can I use credits to purchase coloring books? Yes. If you choose to, ReallyColor credits can be used to make any purchases on our site. Can I send a photo credit to someone else? Yes! You can purchase as many photo credits you want as a gift. A Photo Credit Code will be sent to the recipient's email address. What is a photo credit code? A ReallyColor Photo Credit Code can be redeemed on the home page. Each code has a specific number of photo credits associated with it. For example, if you purchased 20 photo credits as a gift for somebody else, the code sent to that person can be redeemed at any time and 20 photo credits will be added to that person's ReallyColor account. I purchased or received a gift card or voucher with a ReallyColor Photo Credit code. Can I just redeem it on the homepage? Yes! It’s easy! On our homepage, just type in your code where it says “Have a photo credit code or pin?” and click on REDEEM. Your ReallyColor account will be credited for the amount of photo credits represented on the card. Remember that once your photo credits are in a new or existing ReallyColor account, they do not have an expiration date, so come back anytime to make more coloring pages! Do you store my images and completed coloring pages? No. Once you complete your coloring page, it will be available for download right there as well as be sent to the email address you give us for your own safekeeping. We strongly recommend that after you use a credit to complete a page, you open it right there (PDF file) and save it just in case of the rare email issue that is out of our control. Also, if you simply share the image of your coloring page as an attached photo in a social media post, that coloring page will not be stored on our servers in any way. Can I store my completed coloring pages online? Yes! There a number of storage solutions such as Dropbox, iCloud, Microsoft OneDrive and Google Drive. Our recommendation is that you use Google Drive. Once you complete your coloring page, it will be available for download right there as well as be sent to the email address you give us. When using smartphones or tablets, you will need to install the Google Drive App on your smartphone http://drive.google.com. Saving or uploading your coloring pages to Google Drive will allow you to access your PDF pages wherever you have Internet access. The most important thing is that if your pages are saved on Google Drive, you will be able to upload them from a smartphone when making your coloring book. This is only necessary when using a smartphone or tablet since when using a desktop, the files can be uploaded directly from your computer. Do I need a google account in order to use Google Drive? Once your photos have been uploaded and you have downloaded and received your coloring pages, your content is removed from our servers. We do this for your privacy and security. However, if you decide to share your coloring page on Facebook or other social media directly from the ReallyColor web site by clicking our SHARE button, that photo and coloring page will be viewable by anybody who clicks on the link in your post. If you simply share the image of your coloring page as an attached photo in a social media post, that coloring page will not be stored on our servers in any way. How is my completed coloring page sent to my email address? Why do I need a membership with a login and password? Your membership exists only to manage the balance of Photo Credits that you have purchased. When you are logged in, it will keep track of and display how many photo credits you have left. If you purchase more credits, your balance automatically goes up. Can every single photograph be converted into a good ReallyColoring Page? As with anything in life, you get what you give. Unfortunately, there are a small percentage of images that do not convert into ReallyColoring pages well. However, the vast majority of images convert very well. How do I make sure my photos will turn into good ReallyColoring pages? Your original images should be as high resolution as possible, with good lighting, and should not be too small or wide (like panoramic shots). The problem images are usually small, blurry, out of focus, dark, have a dramatic photo filter applied to them, or contain a large amount of detail. Pictures taken in decent lighting by digital cameras and smart phones (even older ones) are usually more than high enough quality for a great ReallyColor experience. Can you tell us whether or not our original image will turn into a good coloring page? Our conversion tool now offers a new, sophisticated scoring tool custom-built by our image science team. It will analyze your original photo when you upload it and assign to it a quality score between 1 and 100. This should set your expectations prior to continuing the conversion process. A score above 50 is usually pretty good. Can I make small edits to my coloring page? Yes. There is an editor built into the conversion tool. Spend as little or as much time on your final coloring page as you wish. You can make small improvements like delete lines under eyes, quickly click away unwanted spots, or spend time making everything perfect. The free drawing feature allows you to fill in lines in your coloring page, or “hand draw” text, stick figures, or whatever impressive free-style drawing you come up with yourself. Can I use ReallyColor on my mobile device? Yes! You can use ReallyColor from any mobile web browser (smartphone or tablet). For the iPhone or iPad, you will need to install the Google Drive App on your smartphone http://drive.google.com. 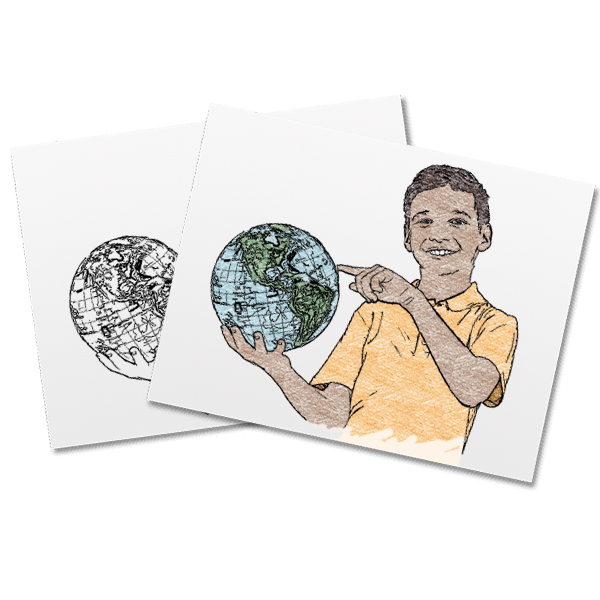 Saving or uploading your coloring pages to Google Drive will allow you to access your pages online wherever you have Internet access. Android smartphones and tablets have a ‘downloads’ folder on your device where you can save and later access your PDF coloring pages. Is there a ReallyColor mobile app that lets me do everything? Not yet, but we are obsessing about this! In the meantime, you can use ReallyColor.com and create ReallyColoring pages on your mobile web browser (smartphone, tablet, etc.). You can print your ReallyColoring Pages and books on your printer just like anything else. Just open the PDF file we send you, and print it out. This is also possible from your mobile device (phone, tablet, etc.) if it has access to a printer. Can I make a coloring book using my ReallyColoring pages? Can I upload photos into the coloring book maker and will they be turned into ReallyColoring pages? Can I make a coloring book using coloring pages I have from somewhere else other than ReallyColor? Is it easiest to make a coloring book from a desktop computer? Yes! When using a desktop web browser, the files can be uploaded directly from your computer. Can I use my smartphone to make a coloring book? Yes! Just start uploading the photos on your phone into the coloring book maker to get started. However, if you already have your coloring page PDF files saved and in your possession, you will need to find an online file storage solution in order to upload them into the ReallyColor coloring book maker from your smartphone. We highly recommend Google Drive. The most important thing is that your PDF files are saved on Google Drive, so you will be able to upload them from a smartphone when making your coloring book. Again, please remember that you can make the pages of your book(s) by uploading photos into our coloring book maker right from your smart phone, in which case an external storage solution is not required. Where should I keep my ReallyColoring page PDF files? Our suggestion is that when you are organizing which coloring pages you’d like to include in your book, you place them in one folder on your desktop computer so it will make bulk uploading as simple as dragging them all onto your coloring book at once. Once they are uploaded, you simply drag and drop them onto the pages where you want them to appear. Can I leave blank pages in my coloring book for drawing or note taking or whatever reason I want? Yes! When you are making your book, you can leave any pages blank that you’d like. Since the price of the final book is determined by number of pages, just keep in mind that even if a page is blank, it still counts as a page. What size books can I create and how much do they cost? Can I save my coloring book to finish working on it later? Yes, we give you the option to save your book for 14 days, so you can come back later to complete it. Shipping is FREE! Your book(s) will delivered to you in 5 to 7 days. Can I do overnight shipping? Can I upload photos and other images to be included in my coloring book? What kind of covers do you offer? Our books have full color covers. You can choose from a number of themes during the customization process and also add your own title. What kind of binding will my coloring books have? Will my coloring book pages be printed on the front and back? Can you ship my coloring books to an addresses outside the United States? The idea for ReallyColor was sparked one day while our CEO, Dieter Marlovics, watched his daughter use her crayons and markers on tables, chairs, floors, clothes, walls, his hair, a dog (but he got away), her shoes, and then explaining how she simply wanted to change the color of...well...everything! He thought to himself how cool it would be for her to be able to color something real instead of the constant barrage of fictional cartoon characters. There were a few nervous sleepless nights spent staring at the ceiling, which ended in the morning with his laughing little girl jumping on him cannon ball style...Dieter wasn't laughing. He decided to build a prototype to see if coloring real photos could even be done well enough for at least his daughter and her friends to have fun with. The rest, as they say, is history.